A Dorset Affair was the title of a CD I made of some of my music, produced (in 1996) in aid of what was then called the ME Association (Chronic Fatigue Syndrome). It owes its existence to the generosity of many wonderful musicians, who performed for free. Rod Adams too worked tirelessly and patiently to record and edit all the tracks. He never asked for payment. 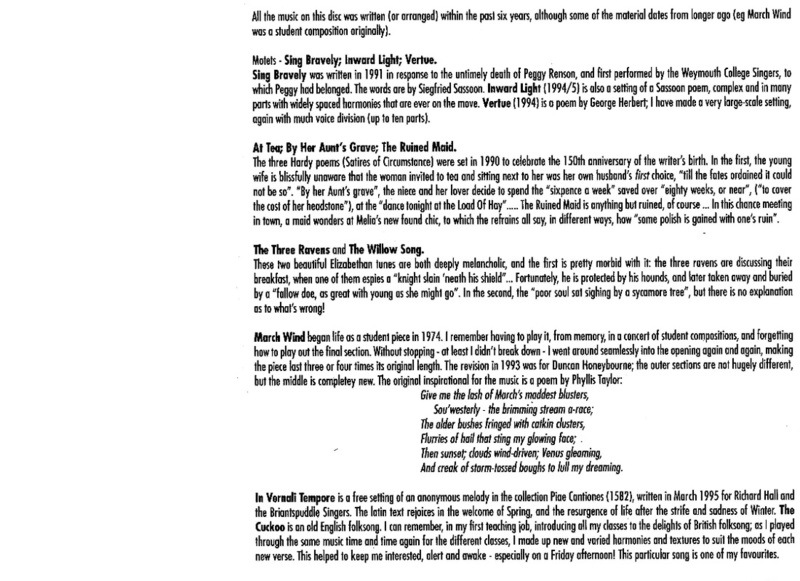 I have reproduced below the CD notes, and then all the tracks are playable. All the music on this disc was written (or arranged) within the past six years, although some of the material dates from longer ago (e.g. March Wind was a student composition originally). Motets – Sing Bravely; Inward Light; Vertue. Sing Bravely was written in 1991 in response to the untimely death of Peggy Renson, and first performed by the Weymouth College Singers, to which Peggy had belonged. The words are by Siegfried Sassoon. Inward Light (1994/5) is also a setting of a Sassoon poem, complex and in many parts with widely spaced harmonies that are ever on the move. Vertue (1994) is a poem by George Herbert; I have made a very large-scale setting, again with much voice division (up to ten parts). At Tea; By Her Aunt's Grave; The Ruined Maid. The three Hardy poems (Satires of Circumstance) were set in 1990 to celebrate the 150th anniversary of the writer's birth. In the first, the young wife is blissfully unaware that the woman invited to tea and sitting next to her was her own husband’s first choice, ''till the fates ordained it could not be so''. ''By Her Aunt's Grave'', the niece and her lover decided to spend the ''sixpence a week'' saved over ''eighty weeks, or near'', (''to cover the cost of her headstone''), at the ''dance tonight at the Load of Hay''…… The Ruined Maid is anything but ruined, of course… In this chance meeting in town, a maid wonders at Melia's new found chic, to which the refrains all say, in different ways, how ''some polish is gained with one's ruin''. The Three Ravens and The Willow Song. These two beautiful Elizabethan tunes are both deeply melancholic, and the first is pretty morbid with it: the three ravens are discussing their breakfast, when one of them espies a ''knight slain 'neath his shield''… Fortunately, he is protected by his hounds, and later taken away and buried by a ''fallow doe, as great with young as she might go''. In the second, the ''poor soul sat sighing by a sycamore tree'', but there is no explanation as to what's wrong! \t\tAnd creak of storm-tossed boughs to lull my dreaming. In Vernali Tempore is a free setting of an anonymous melody in the collection Piae Cantiones (1582) written in March 1995 for Richard Hall and the Briantspuddle Singers. The latin text rejoices in the welcome of Spring, and the resurgence of life after the strife and sadness of Winter. The Cuckoo is an old English folksong. I can remember, in my first teaching job, introducing all my classes to the delights of British folksong; as I played through the same music time and time again for the different classes, I made up new and varied harmonies and textures to suit the moods of each new verse. This helped to keep me interested, alert and awake – especially on a Friday afternoon! This particular song is one of my favourites. 1. The Old Man from Lee. This freely arranged melody was originally sung by an unnamed singer from Coggeshall (Essex) in this version. The theme is a very common one in folklore, and widespread…. 2. I Wish, I Wish. This is a sad song about betrayal of love; the singer has been loved and left for a younger woman. There is the common ''apron-low'', ''apron-high'' motif – the maid's slim belly and the mother-to-be's rounded form. The accompaniment is upper strings only. 3. The Loyal Lover. This is a song of love and devotion for a lover who is away at sea. While the 'cello's ostinato represents some (imaginary) mundane task being undertaken, the rich imagery of the poem is reflected in the 1st violin's music. 4. Bonnie George Campbell rides out on his mount, but only his ''guid horse'' comes home. The Scottish dialect is mostly understandable, but here are some translations for some of the harder phrases: ''out came his mother dear greeting fu' sair'' (crying sorely); ''And out cam his bonnie bryde riving her hair'' (tearing her hair); ''But toom (empty) cam his saddle to see''. At the end I have set a magnificent Scottish lament – Lady MacRobert's Lament, sometimes known as The Flight of the Eaglets. I am indebted to ''Bonnie'' George Hearton for advice generally, and help with pronunciation and translation. 5. Rare Willie Drowned in Yarrow. Verses alternate between a suspension of belief, and hard realisation of Rare Willie's tragic fate. 6. The Unquiet Grave is a ghost story in verse/song. I have changed the words slightly to have the woman sitting on her lover's grave, rather than vice versa. She sits there for so long – twelve-months and a day – that ''the dead began to speak''…. 7. The Miller's Daughter is a saucy tale with a quite unexpected conclusion!…. The pieces were 1st performed in June 1995 at Kingston Maurward, by Christine Page and the Cleyndert Quartet. 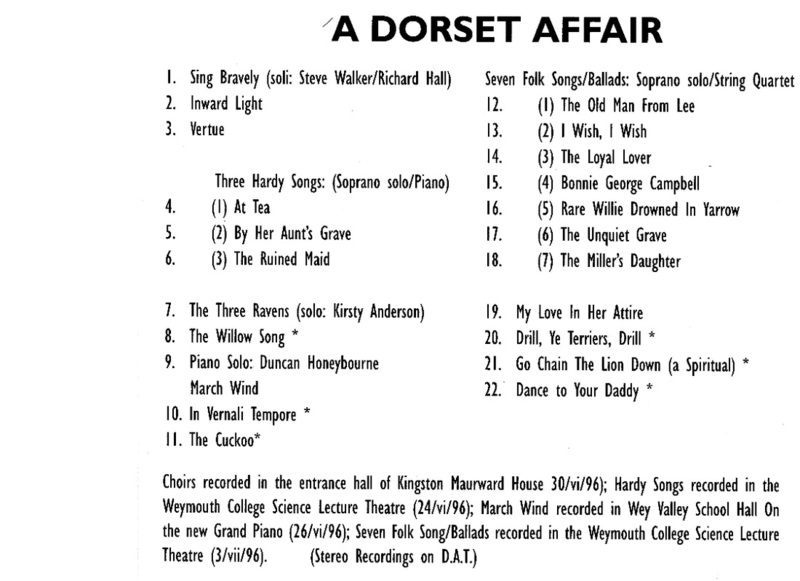 The concert was arranged by and in aid of the Dorset Group of the M.E. Association, to whom half the proceeds of the sale of this CD is donated. This music is dedicated to Peter Oakes, my friend, and adviser, co-director of the Occasional Singers, and himself a former sufferer of M.E. When all her robes are gone. Drill, Ye Terriers is a humorous tale about social injustice: ''big Jim Goff'' is docked for the ''time he was up in the sky'', sent up there by a ''premature blast'' at work…. I discovered the spiritual Go Chain the Lion Down by chance, and took instantly to it; I had never seen it before 1992, and haven't seen it since. Dance to Your Daddy is very well known in many different forms. My free arrangement makes use of two themes, and a pot-pourri of words from all sorts of sources. 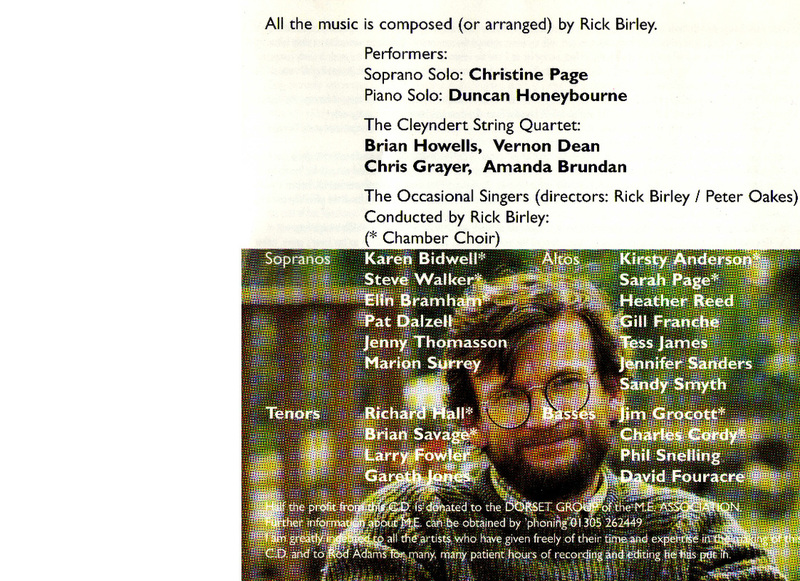 All the music is composed (or arranged) by Rick Birley. 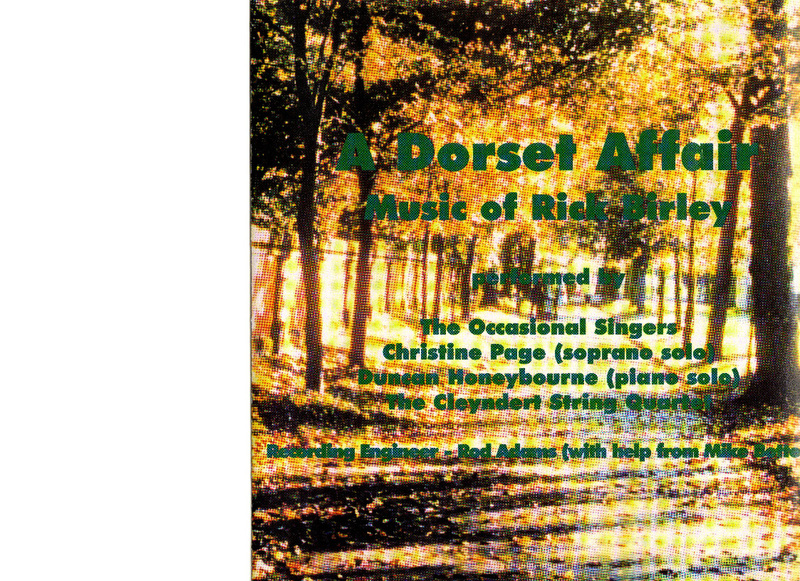 Half the profit from this CD is donated to the DORSET GROUP of the M.E.ASSOCIATION. I am greatly indebted to all the artists who have given freely of their time and expertise in the making of this CD and to Rod Adams for many, many patient hours of recording and editing he has put in. I have lived in Dorset for just over 30 years, so feel a little bit less of an outsider now. This is a fabulous part of the world and, along with Sussex, Wiltshire and Pembrokeshire, has shaped my being. In particular it has moulded a good deal of my writing, since I have been immersed in Dorset folksongs many of which I have attempted to set in my own particular fashion. I do not do anything by halves, and feel that I have worked very hard – joyfully hard – to know and understand this county of my adoption. The friendships I have made here have been immensely strong and enduring, and I could not possibly contemplate leaving my present home. My home is my spiritual fortress. November 2014. In recent months I have found everything just a bit more of a struggle, as the degenerative nature of Parkinson's Disease takes another inexorable step towards reducing my mobility. Being a generic disorder, and neurological, the physical symptoms intrude into every aspect of everyday living. And it is not just physical; Parkinson's also affects moods, concentration, and memory. Three years ago I was still working hundreds of hours each week composing (or occasionally painting or writing poetry). Since my father died on January 2, 2012, I grew to be creatively listless. I no longer seemed to burn with a desire to compose. Part of this is due to my continual failure to interest any professional orchestras in the possibility of actually performing any of my music. This inevitably led to the sad and frustrating conclusion that I will probably never hear most of my music, except in the artificial forms I have created on this website. This is better than nothing, but hardly very satisfactory. So, in those long periods where most people were in bed sleeping, I was still up and about, but listening to the World Service or reading on my Kindle rather than composing or painting; sometimes I was "googling" or, even more fun, "you Tube-ing". It is amazing what there is out there if you look for it! But of late, thankfully, I am rediscovering a desire to write afresh; revisiting unfinished projects like the violin concerto, and starting new scores. Depression is an inescapable presence. The sort of black oppression I felt seemed to block out the desire, even, to do anything particularly constructive. Rationally I know and understand that activity and physical exercise are both good things for combating depression, but the inertia threshold seemed to grow in size in direct relationship with the weight of depression. Fortunately, at these low times, I had my wonderful & very energetic cocker spaniel Maverick needing walks. I had a moral obligation, a huge responsibility to feed his desire for getting out and about. So he benefited, and actually I did too, since growing tired after 4 or 5 miles walking in the empty woodland certainly does something to shift the black mass. Frightened, I suppose, that I would never write again, I also set out at this time to make a list of all that I have produced over the years. This has turned out to be a rather large list with well over 100 compositions, the majority of which are quite substantial works. I have taken the precaution of copying these as they are onto various capacious memory sticks (feeling rather strange, holding a tiny thing which contains my entire compositional output in electronic format). I am stealing myself to produce hard copies, some for me to keep, and some to give to friends for safekeeping. In the event of a fire or whatever, it would be nice to know that not everything would have been lost! What holds me back, apart from the cost, is pure vanity, since I very rarely completed any compositions to publication standard. Tidying up scores takes an inordinate amount of time and trouble, and is horribly tedious and uncreative. But it has to be done and I am gradually getting about the task. I cannot allow untidy, incomplete scores to be made. Maintaining this website has also been quite a therapy, allowing me to post sound files, pictures, writings and poetry. No one has to look at it, but it is there. According to Google analytics thousands of people visit the site every month, although I'm sure many of these are entirely by accident. I hardly ever get any feedback, even though there is a form for this. I know that some people must explore the site in some detail, since the ratio of visitors to pages viewed is about 1 to 6. I am also able to see which pages are most visited – and I'm curious to know why the Durham papercuts are about 4 or 5 times more popular than any other page. Other things have happened this past two or three years as well, which have contributed to my depression: my mother-in-law's devastating stroke, cancer and death; cancer in my immediate family, and other difficult issues. It is at these times that one's family and one's friends are so incredibly important, actively offering support or just by being who they are. Networking is so very important! All those who performed for the CD have been named, and I have reproduced above all the CD inserts. Given the relatively few performances of my music, these recordings are so precious to me. I am so grateful for the help of so many friends.